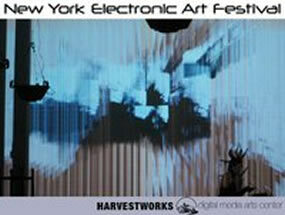 Harvestworks Digital Media Center presents the 3rd biannual New York Electronic Arts Festival [May 27th – Sept. 25th] Celebrating all forms of innovative new technology and art, Bora Yoon and Luke DuBois perform at the historic St. Paul’s Chapel of Trinity Wall Street church (across from Ground Zero), alongside Satoshi Takeishi’s “Whirlpools”, w/ post-show Q&A Artist Talk to follow. This performance will premiere new custom technology The Body Electric, developed through a residency at Harvestworks Media, with groundbreaking Kinect sensor technology by Microsoft, and acclaimed programmer and longtime collaborator Luke DuBois. Bora Yoon is a 2010 Artist Fellowship recipient of the New York Foundation for the Arts (NYFA). This presentation is co-sponsored by Artists & Audience Exchange, a NYFA public program, funded with leadership support from the New York State Council on the Arts (NYSCA).